Atlas Reactor has a story... 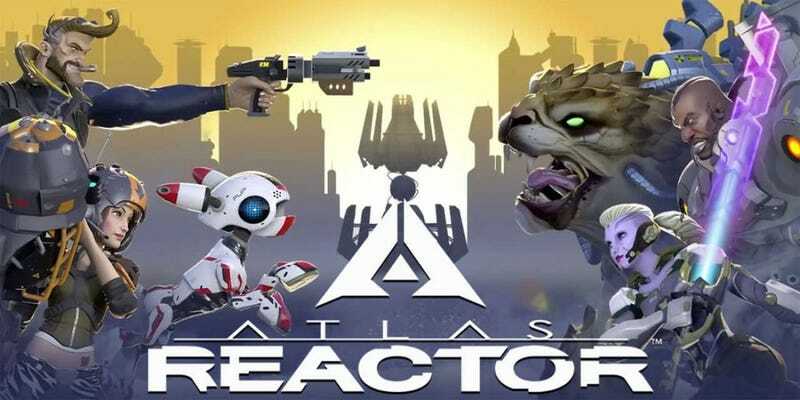 I guess, kind of... Three corporations are fighting over control of the final Atlas Reactor on the planet in order to uh... do um... things? I think? And you take control of 1 of 23 freelancers that has been hired to take... Look I have no idea what the story is, and it doesn’t really matter. I like my story better: Choose character, join team, kill other team. It’s straight forward, simple, and to the point. Seriously... Nobody is playing this for the story. Thes are your damage moves, your bread and butter main attacks, as well as other powerful cooldown attacks. Use these to kill the other players. These often have other abilities attached to them (knock backs, debuffs etc). Use one of your knock backs if you have one to push an enemy into the open, or knock them into traps for some big damage. Each character has their own unique moveset, as well as three catalyst moves, which are basically single use items every character has access too each match. Catalyst, for me at least, are usually my “oh crap I’ve done something wrong, and am about to die” abilities. Basically the whole game is co-ordinating with your team, and trying to anticipate what the other team is going to do. You don’t have to target your attacks on a certain character, you can target them anywhere. Think your opponent is going to dash to that power up? Aim your attack in that area, and you can punish them, but if you’re wrong, you’re hitting nothing but air. Think you are about to get attacked with something big? Dash outta the way, but maybe they faked you out, and now you can’t escape next turn. It’s like a violent multiplayer game of chess, and the turn based combat really works for me.